(Bloomberg Opinion) -- Gather 'round while I put Apple Inc. on the psychiatrist sofa. This company appears to constantly need a villain -- some company to look down on from Apple's moral high ground. What would Freud say about that? In the early days of Apple, of course, the company's Evil Empires were International Business Machines Corp. and Microsoft Corp., as encapsulated by two famous marketing campaigns. (Yes, children, IBM did make personal computers once upon a time.) IBM and Microsoft were convenient foils. They were lumbering, vicious and uncool -- the opposite of what Apple wanted to be. Then early in this decade, Google became Apple's villain. The two companies had collaborated closely on the Safari web browser and the original iPhone, but the good times ended when Steve Jobs believed Google’s Android operating system for smartphones ripped off the iPhone. As my Bloomberg News colleague Brad Stone helped chronicle in 2010, Jobs told Apple employees during a meeting early that year: "Make no mistake: Google wants to kill the iPhone. We won't let them." As in Apple's early history, the Google feud was about business, bruised feelings and pragmatism. Having an enemy helped energize Apple employees to keep slogging away in service of the Good Fight. It was clear this week that Facebook Inc. has become Apple's new supervillain. And in showing Apple's new features to help people monitor and limit the time they spend on smartphones, Apple opted to show Facebook's Instagram as the example of an app people might want to limit. It all felt incredibly targeted at Facebook. Apple executives have been consistent over the years in bashing digital advertising companies including Google and Facebook, but the criticism feels even harsher now. Apple's beef with Facebook is odd. Unlike Apple's past antagonists, Facebook is not a competitor. Apple has little to gain financially or strategically if Facebook falls. If anything, the popularity of Facebook's products has been a boon to Apple because the social network and the company's other apps make iPhones more appealing. Apple may truly believe that Facebook is bad for the world and that its quibble with the social network is philosophical rather than financial. But Apple needs to be careful. It's cool to bash other companies when you're an underdog. 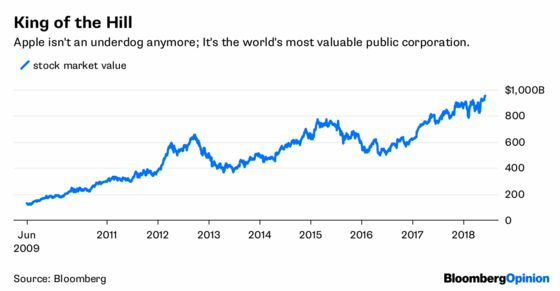 It's not cool to punch down when you're the most valuable public company in the world — on your way to the $1 trillion market cap milestone. To be fair, it’s easy to claim the moral high ground against Facebook right now. But again, there's a risk. When Apple says Facebook's ad-dependent business model makes the company inherently hostile to consumers, I wonder about Apple's own advertising-dependent riches. Apple collects an estimated $3 billion to $4 billion or more each year from Google in exchange for making its web-search tool the default option on Safari browsers. 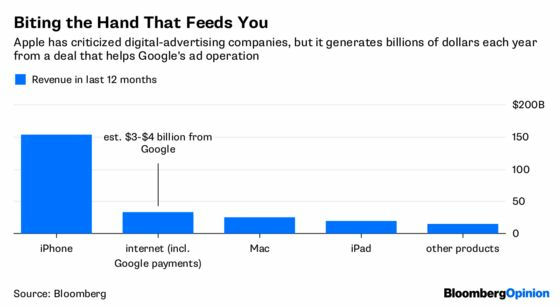 If Apple wants to be the moral authority on digital privacy, that position is undermined by taking all those high-profit dollars to bolster Google's ad machine. The Wall Street Journal also reported recently that Apple hopes to expand its own digital-advertising business. Again, it will be a relative drop in the bucket compared with Apple's revenue from selling hardware, and I'm sure Apple will say that it won't do the aggressive personal-data collection and ad-targeting that Facebook and Google do. Still, it's tough for Apple to both bash digital-advertising companies and increasingly borrow from their business models. I get why Apple likes to have a Lex Luthor to its Superman. Feeling superior is excellent motivation. But Apple's creation of technology enemies is wearing thin with time and its growing riches.